The STE. 16, our second collab. with eowave designer Marc Sirguy, is a dual LFO, featuring a HI-freq mode and complex waveform mixing possibilities, which thinks nothing of producing thousands of different modulation and audio frequency shifts and wiggles. In fact, it doesn't think at all—well maybe it does... since we here at SE suggested feature tweaks which were incorporated into the final layout. 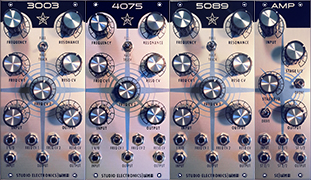 The STE's amplitude modulation, frequency modulation, and waveform mixing and blending push the envelope far above and beyond typical/classic four waveform LFOs construction and limit, and so now shall you. 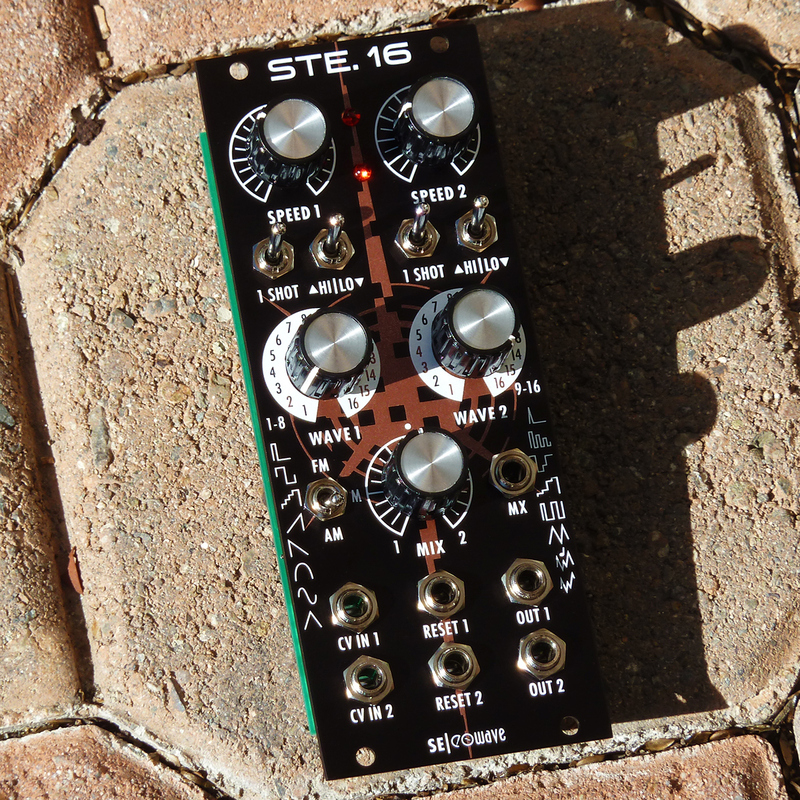 The 1 SHOT function dramatically transforms the STE into a punchy and varied percussive tool; applied to an external VCA, one can generate compact and expansive, concussive encounters. More experimental tonal space can be explored via the AM function, with LFO 1's starting rate somewhere near the low end of the STE's vibrational spectrum: 5Hz (about 3:40s), and LFO secondi ultimately demanding its 6kHz scream, shatter, and fracture ceiling of thrills and audio frequency chills. With sixteen waveforms per LFO, setting the initial fragmentizing, gyrating, LoFi digital oscillating process (whenever you are ready), can be a most impulsive, and highly engrossing pursuit. SPEED - Sets rate of LFO. 1 SHOT - LFO waveform plays once—needs to be triggered by the reset input. HI/LO - In HI mode (6kHz at the top of its range) the LFO reaches the audio range—think LoFi digital oscillator; in LO mode, (starting at 5Hz) a very patient 3:40 long sweep is possible. WAVE - Sets one of 16 different waveforms: triangle, sine, dome, ramp up, ramp down, stairchase, square, 1/2 square, impulse, four decreasing squares, random, random increasing, random pulse with, random triangles, pitched noise, and digital noise. FM - Frequency modulation from LFO 2 to LFO 1; the Mix pot will set the amount of modulation. AM - Amplitude modulation from LFO 2 to LFO 1; the Mix pot will set the amount of modulation. MIX - Mix setting of LFO 1 and LFO 2. MX (MIX) - Mix output of LFO 1 and 2. CV - Affects the speed via an external voltage. RESET - Resets the waveform. 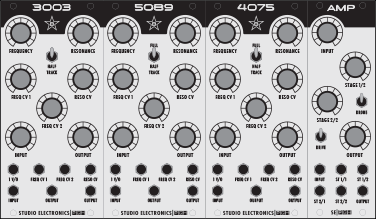 OUT - Balanced LFO output: FM/M/AM three position switch sets the type or mix of modulation outputted. 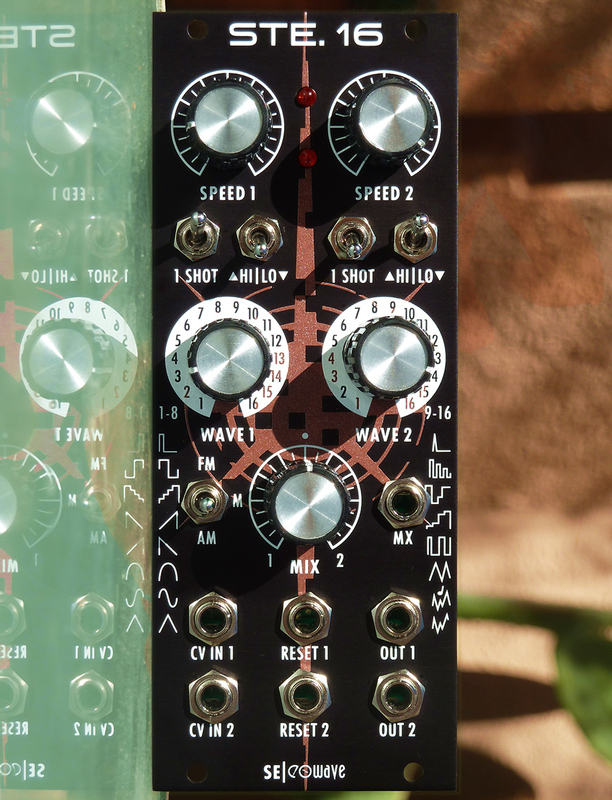 Eleven patch points: 1 SHOT, HI/LO (x2), MX, CV In 1, RESET 1, OUT 1, CV In 2, RESET 2, OUT 2.